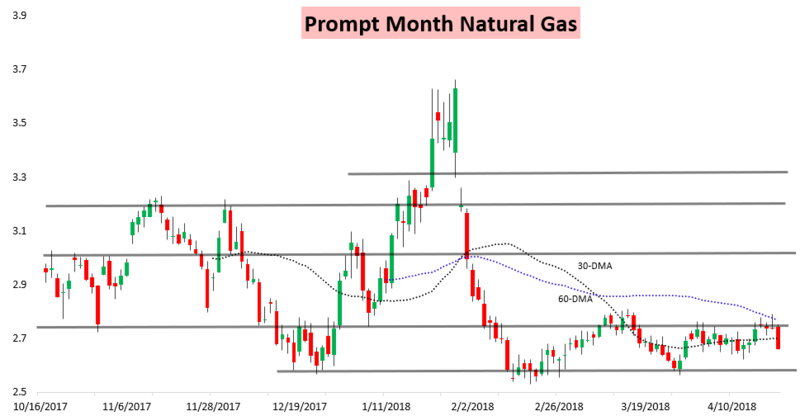 The prompt month May natural gas contract plummeted almost 3% today, initially touching the $2.79 level yesterday and briefly moving below the $2.66 level today. 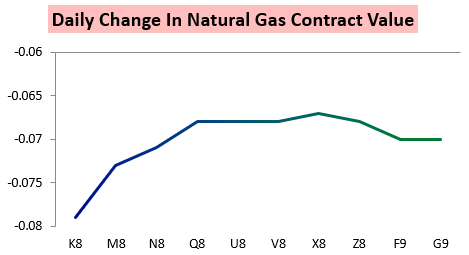 Losses were not significant just at the front of the strip, but rather all along the natural gas strip, as oversupply fears pushed prices through 2019 down just as much. 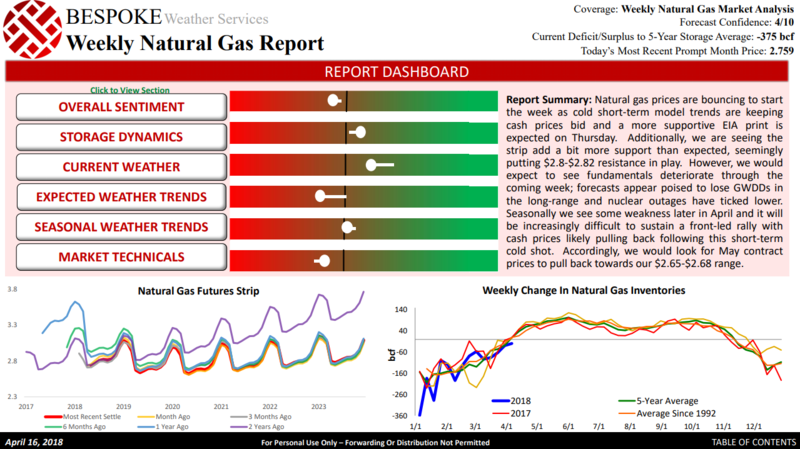 These concerns were so significant that not even a bullish EIA print this morning could keep natural gas bid. 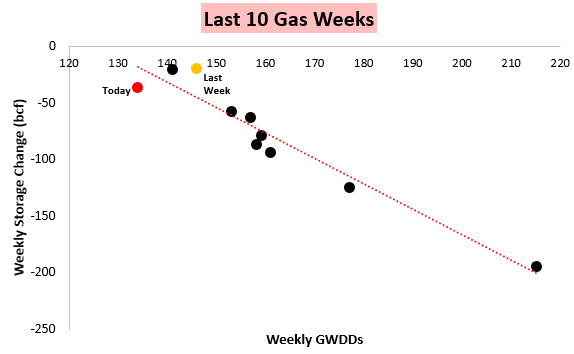 The EIA announced that for the week ending early April 13th we withdrew 36 bcf of gas, far above our estimate of 23 bcf. Though prices initially spiked around 5 cents off the announcement, they lost all that and more through the remainder of the trading day. 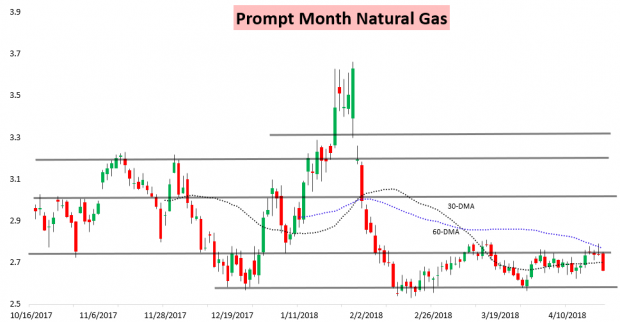 This type of move was not entirely unexpected, as our Weekly Update from Monday that gave our price action expectations for the week called for a move back into the $2.65-$2.68 range. Still, the selling was particularly impressive given how widespread it was, with the V/F spread actually ticking narrower on a day where the prompt month contract fell almost 3%. Spreads had been flashing bearish warning signs yesterday that this type of selling could be on the way, as we explained in yesterday’s Afternoon Update. These signals were clearly strong enough to cancel out an EIA print that was seen as solidly tighter than many of the last few. 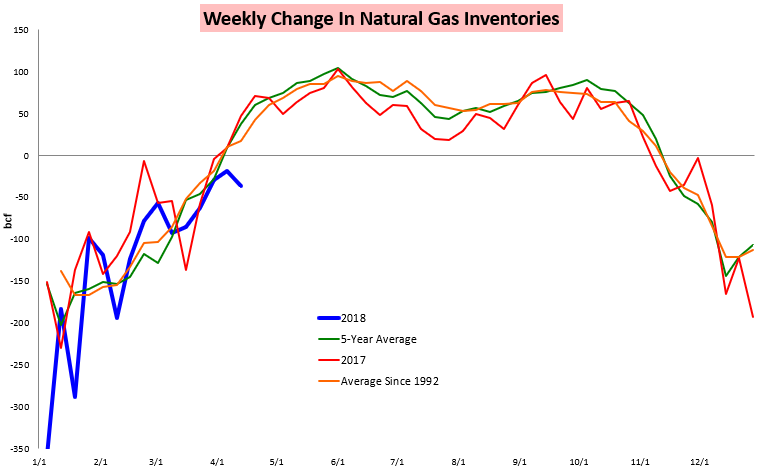 Undoubtedly traders will be watching for a similar reaction later along the natural gas strip tomorrow to see if selling should ease or oversupply concerns into 2019 will continue. Incremental weather changes will continue to play a role for spreads at the front of the strip, and we will be diving further into our reading of adjusted balance following today’s EIA data in our reports tomorrow, allowing clients to see how price risk now appears skewed moving forward.